Built-in player supports playing 1000+ video and audio formats. Convert MOV video to MP4, AVI, WMV, FLV, MKV and more. 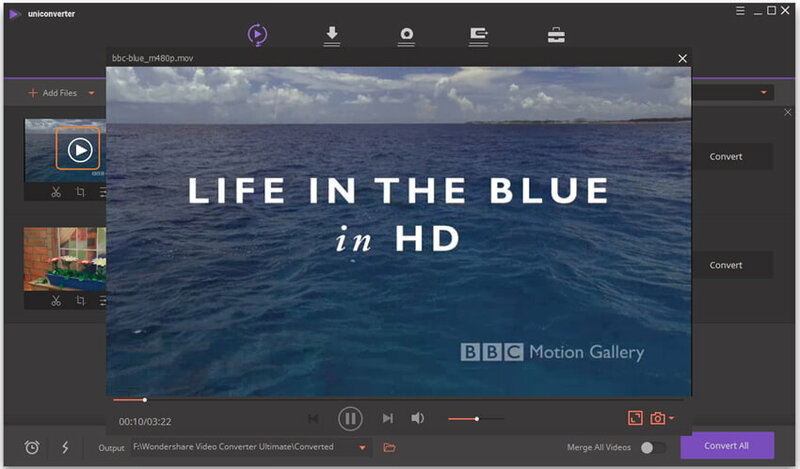 Versatile toolbox combines screen recorder, GIF maker, cast video to TV and fix video metadata. Chances are that you can't play MOV video in Windows Media Player or QuickTime if you haven't installed the extra codec to extend your player, however, things still happen even if you've added the additional codecs that you can get sound but no picture while playing MOV file. Is there any powerful MOV player that guarantees to play MOV with 100% success? Yes! All-in-one Wondershare UniConverter (originally Wondershare Video Converter Ultimate) that combines MOV player and MOV converter would be of great help, it not only allows you to directly play MOV file but also supports converting MOV to any format friendly to your media player. As introduced above, Wondershare UniConverter (originally Wondershare Video Converter Ultimate) is such a powerful MOV player and converter. To smoothly play MOV on Apple device like iPhone, iPad, Apple TV and other media player, you can either play MOV with the built-in player or convert MOV to other compatible formats for playback. For more details, please refer to the step-by-step tutorial below. 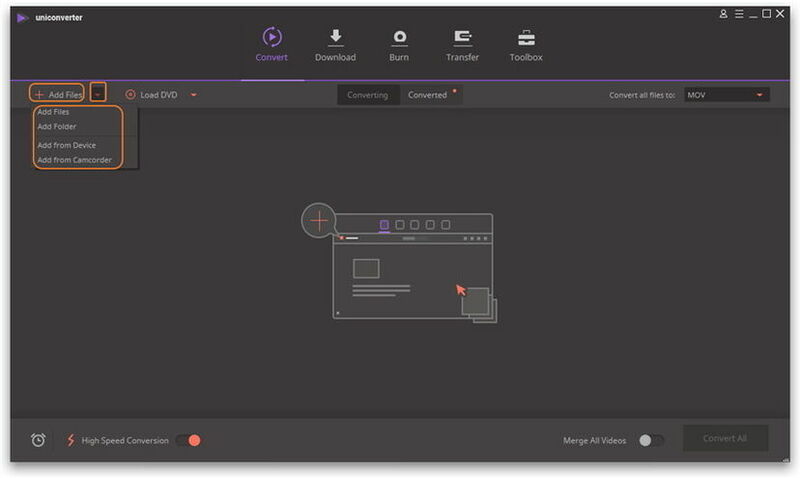 Click to import your favorite MOV video to the player, or directly drag-and-drop them to the main interface. Then you'd see the video thumbnail for the loaded MOV video just as the screenshot shows. Click the play icon in the middle and you'll see the MOV video starts playing immediately. Just as mentioned above, you can either click + Add Files or directly drag your target MOV video to the powerful converter. Go to the Target section and click to expand the output format list. There'll be Recently, Video, Audio and Device 4 tabs, choose one and select the specific format and resolution afterwards. If you want to play MOV in Windows Media Player, you can select WMV as the output format. 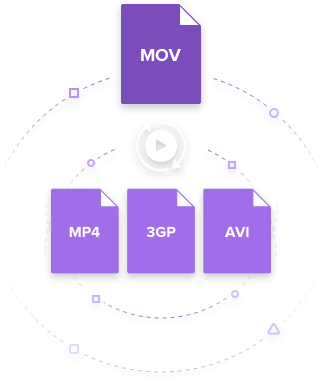 But if your goal is to import MOV files to QuickTime, VLC or other Apple products like iTunes, here, you may choose MP4 and set H.264 as the video codec. Note: You can pick up an optimized output format according to your exact use. To set H.264, you need to hit the + Create Custom to get the further setting window. When everything is set, hit Convert button to convert MOV (QuickTime) to your selected format in Step 2. Once the MOV conversion completes, you can switch to the Converted tab to get the converted video file. 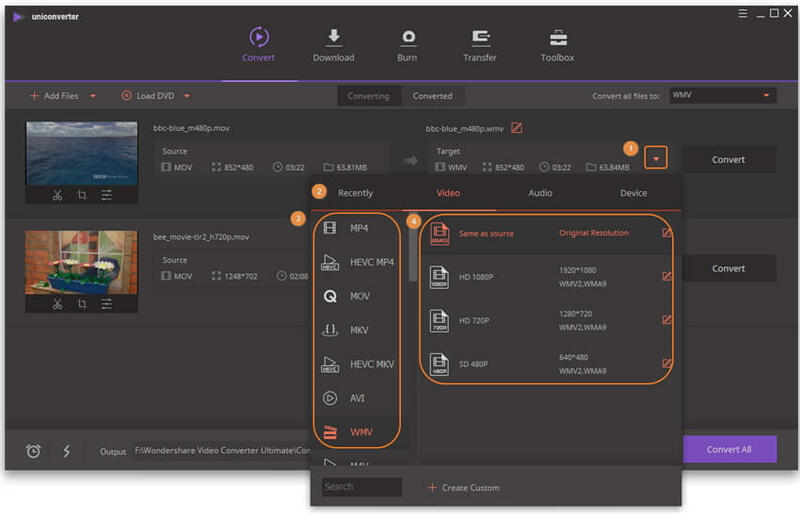 Wondershare MOV Converter also supports batch converting, all you need is to click beside Convert all files to: to choose the output format. Apart from converting MOV to other 1000+ format, it also converts other format to MOV, such as WMV to MOV.